Almost 60 percent of listings that did not sell within the first three weeks have experienced a price reduction, with the average discount around 5 to 6 percent. Distressed properties – government-owned, bank-owned and short sales – remain low to non-existent for buyers hoping to find homes under fair market value. 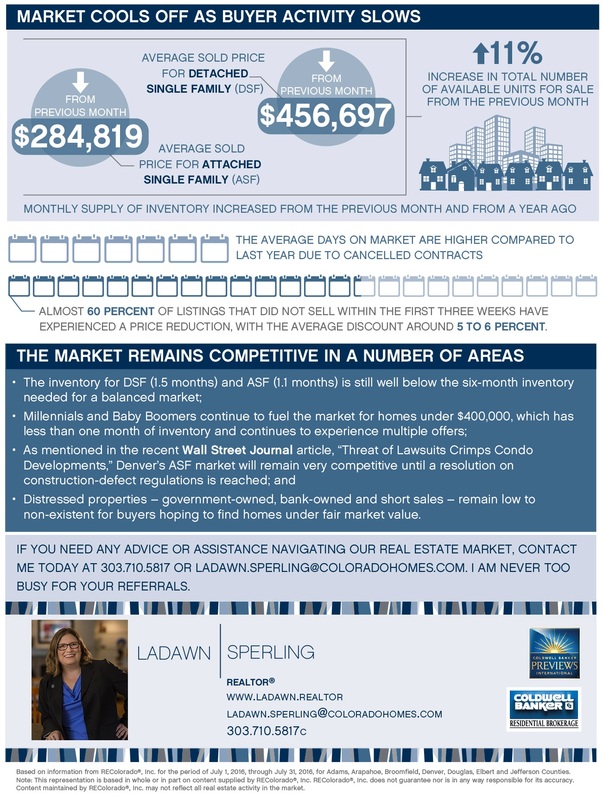 Based on information from REColorado®, Inc. provided by Land Title for the period of July 1, 2016, through July 31, 2016, for Adams, Arapahoe, Broomfield, Denver, Douglas, Elbert and Jefferson Counties. Note: This representation is based in whole or in part on content supplied by REColorado®, Inc. REColorado®, Inc. does not guarantee nor is in any way responsible for its accuracy. Content maintained by REColorado®, Inc. may not reflect all real estate activity in the market.